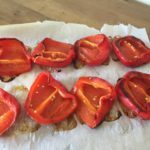 Today I felt like eating a snack and then I remembered that I had some red peppers in my refrigerator so I decided to make some roasted red peppers. 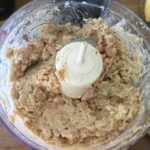 I was originally planning on using all of them to make a tomato-less “tomato” sauce, but then I thought it would be a good idea to make some hummus with them. 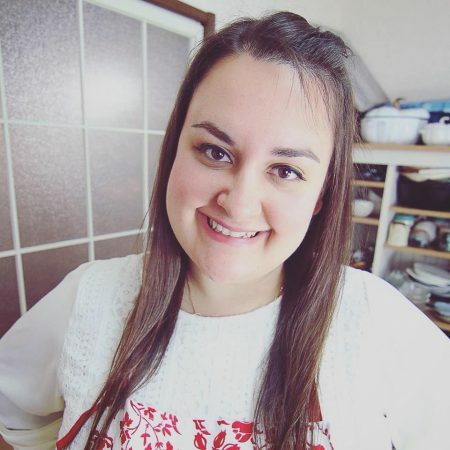 Hummus doesn’t exist in Japan so if I want to eat some then I need to make some, which isn’t hard at all by the way. 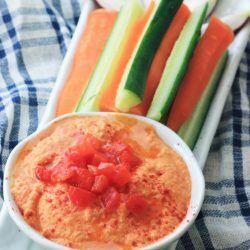 I love hummus because I can eat it with some raw vegetables as a dip or I can add it to sandwiches that I make for lunch. 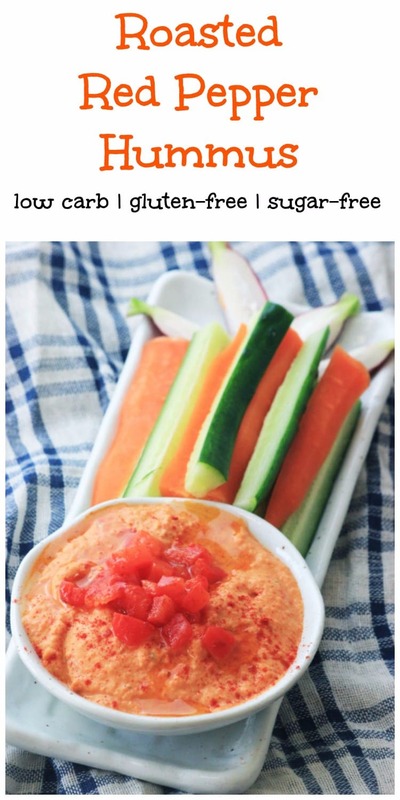 This batch of hummus that I made makes about 1.5 cups (28 tbsp to be exact), so for me this is a really healthy snack to eat with veggies and a couple of tbsp of hummus. I especially like to pack it in a small tupperware so that I can eat something healthy at work when I go hungry. I find that if I don’t bring myself a little snack, I may cheat and go buy something that’s not necessarily healthy. 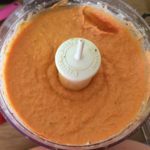 When I make roasted red pepper hummus, I like to blend 3/4 of the red pepper with the chickpeas together to give it a nice orange colour, and usually top the hummus with the last quarter. Some people like to sprinkle a bit of olive oil and paprika powder over. 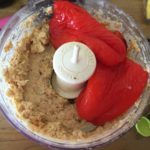 It’s actually quite simple to make roasted red pepper hummus. 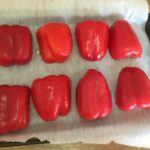 The first step is to bake your red peppers, caps up, for 40 minute-ish at 200C/390F. When they’re done roasting, let them cool down, and them peel their skin off. 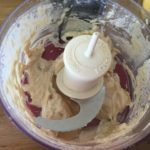 To make the hummus, you first blend the tahini and lemon juice together. 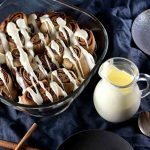 Once it becomes a creamy paste, you add all of the ingredients and mix again. 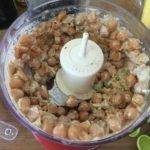 The last step to hummus is adding the chickpeas. You’ll notice that it’s pretty thick. 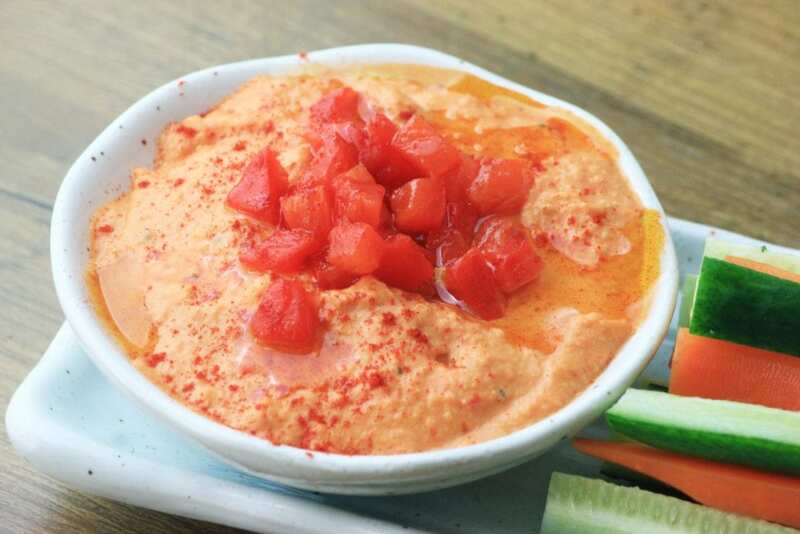 For normal chickpeas, you would simply need to add 1-3 tbsp of water and it’ll become smooth, but for this recipe, since we’re already adding roasted red peppers, the peppers themselves hold a lot of juice, so by adding them, the hummus will become nice and smooth. 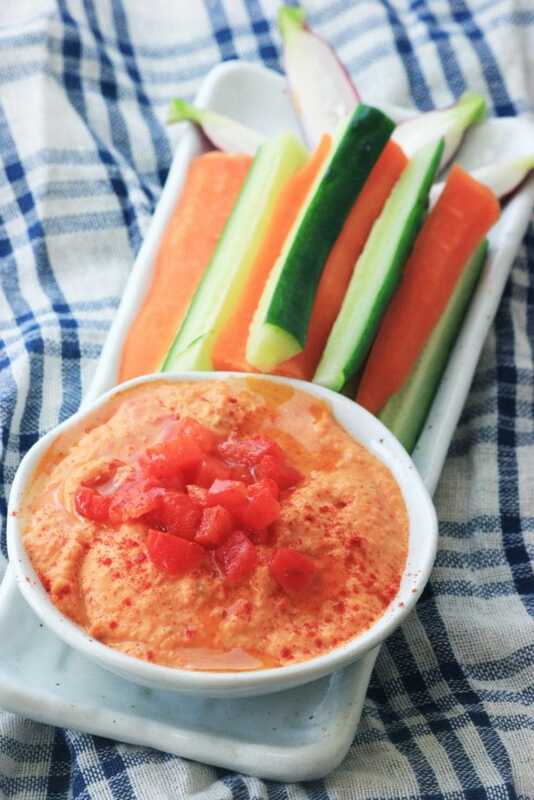 A delicious creamy roasted red pepper hummus with a slight touch of cayenne pepper! 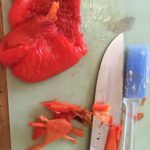 Cut your red peppers in half and throw away the stems. Place the peppers, skin side up, on a baking tray lined with some parchment paper. Take out of oven and let cool down. When the peppers are cooled, peel the skin off. Mince the garlic clove. 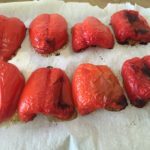 Dice 1/4 of the roasted red peppers. 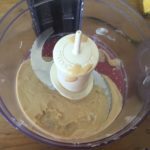 In a food processor, combine the lemon juice and tahini together. Puree for 1 minute. This will create a thick cream. Scrape the sides if need be. Add the garlic, olive oil, salt, paprika, cumin, black pepper, and cayenne pepper. 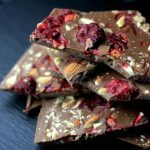 Mix everything for 30 seconds. Add 3/4 of the red peppers into the mix and process for 1 more minute. Put in a bowl, top with the last 1/4 of the red peppers. 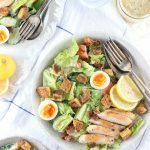 You can sprinkle a tbsp of olive oil and a pinch of paprika powder over to make it look pretty. *Some people like to roast them for much longer, but I feel the skin can be taken off easily at this time. Love this! Adding the red pepper was such a good idea!